Note that the PDF module does not parse the contents of streams, so it cannot determine conformance to PDF/A to the degree required by the ISO standard. Those of us who have spent a significant amount time using or hacking on JHOVE have similar opinions about it’s shortcomings (e.g.). However, it’s not clear that the wider community understands this, and it still gets occasional recommendations as a PDF/A validation tool. Ideally, to resolve this issue, we would be able to test how well JHOVE validates PDF/A documents by running it over a suitable test suite. While we do not yet have a compliance-testing corpus that covers the entire PDF/A standard, there is one for non-compliance with the PDF/A-1b part of the specification: the Isartor Test Suite. The Isartor Test Suite is an excellent resource, and exactly the kind of thing we could use more of in digital preservation. It contains a set of PDF files where each one carefully violates a particular aspect of the PDF/A-1b standard. Each PDF is also self-documenting, in that the text and embedded metadata describe what part of the PDF/A-1b specification is being violated. 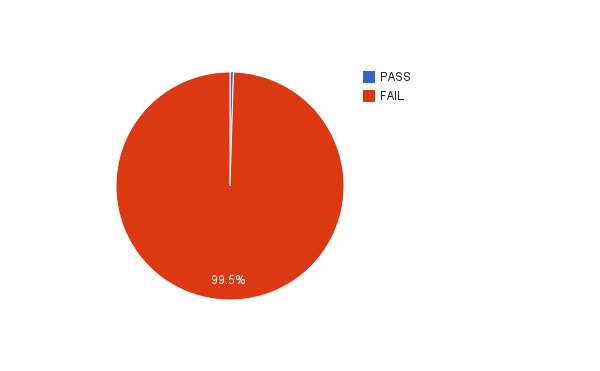 Note that PDF/A-1b is the lowest level of PDF/A compliance, and the test suite only enumerates the individual failure cases. This makes things somewhat easier on the tools, as they only have to avoid false-positive validations at the minimum level of compliance. However, it is still a very useful baseline test. So, if JHOVE can validate PDF/A files, it must be able to validate PDF/A-1b files, and therefore every PDF file in the test suite should be found to be invalid. I used JHOVE 1.111, installed on my Mac via Homebrew. I made scripts to run JHOVE and store the output, and to do the same for all the files. Once I had the JHOVE output, I tabulated and graphed the results. JHOVE only managed to detect one invalid PDF/A-1b file from this set of 204 invalid files. This seemed odd, as even the presence of encrypted data was not being picked up. Closer inspection revealed I’d made the classic JHOVE user error of not double-checking what format and profile JHOVE was validating against. I had specified that JHOVE should validate as PDF, but the interface does not allow me to assert that I intend JHOVE to validate against the PDF/A-1b profile3. To understand what was going on, I had to take the Profile field into account. 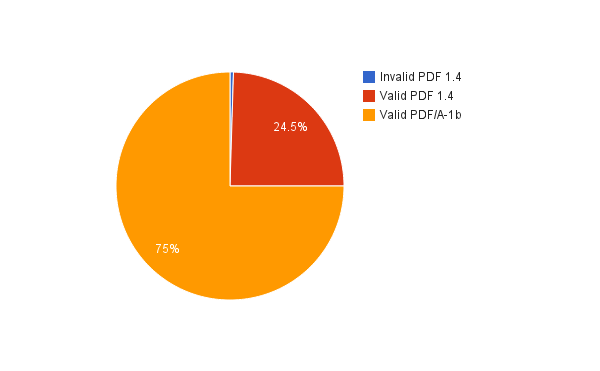 For some reason, despite the presence of the PDF/A-1b declaration in the embedded metadata, JHOVE is failing to identify 51 of the test PDFs as being PDF/A-1b and so only performs the basic PDF-1.4 validation. The remaining 153 test PDFs were correctly identified as being PDF/A-1b, but were falsely determined to be valid. The full, raw JHOVE results are available below. Don’t use JHOVE to validate PDF/A. Maybe try Apache Preflight instead. Here, each filename is linked to the JHOVE output, and is shown alongside the overall validation result from JHOVE. If you want to get an idea of what aspect of PDF/A-1b each file is exercising, you can go and look at the text in the JHOVE output, or examine the original folder structure of the test suite as this reflects the structure of the specification. As an exercise in irony, I'm experimenting with allowing comments on this site using the third-party cloud-hosted probably-no-way-to-get-your-data-out Disqus commenting system. If you think using this system is a terrible idea, please leave a comment below!